Photo courtesy of Stew Milne Lostwax's "Blink"
Begins 8 p.m. Fri., June 22; series continues through Aug. 31. As part of the Kelly-Strayhorn Theater's performance series East Liberty Live!, five performances of dance works-in-progress will cap a summer of artist residencies. The showings will preview evening-length programs that the theater will present in the coming year. The first of them, on Fri., June 22, features Rhode Island's Lostwax, a company known for its integration of dance and digital media. Lostwax offers a 16-minute slice of choreographer/artistic director Jamie Jewitt's latest creation, Particular. "Particular is about the relationship between the flock and the individual," says Jewitt by phone from Providence. Jewitt says the work, set to an original soundscape by R. Luke DuBois, references examples of its theme found in nature and in particle physics. 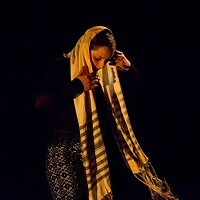 The troupe will also present excerpts from its 2010 work Blinking and from its new dance movie, Melt. 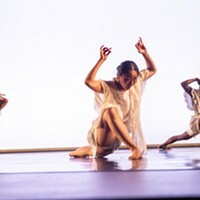 Looking ahead, on June 29, Philadelphia's idiosynCrazy Productions returns to the Kelly-Strayhorn after a successful appearance at last May's newMoves Contemporary Dance Festival. The hip-hop troupe is developing Private Places, which takes a behind-the-scenes look at life as a flight attendant. 2009 Point Park grad Luke Murphy returns to Pittsburgh on July 29 to present portions of his latest multimedia work Drenched. The New York- and Ireland-based choreographer says the work's title is a metaphor for being absolutely consumed with something. In it, two characters (danced by Murphy and Carlye Eckert) contrast the often pie-in-the-sky expectations of a modern-day romance with the realities of one. It's set to an eclectic soundtrack that includes music from Elvis Presley and composer Steve Reich. On Aug. 24, Pittsburgh's Staycee Pearl dance project presents excerpts of choreographer Pearl's Study. The new work explores the notion of "post-blackness," which Wikipedia defines as "a paradoxical genre of art where race and racism are intertwined in a way that rejects their interaction." Rounding out the work-in-progress showings is Bessie Award-winning choreographer Nora Chipaumire's character-driven piece MIRIAM, on Aug. 31. MIRIAM looks at the feminine ideal and the struggles women face balancing public expectations with private desires.